"I am not a criminal...I never posed a danger to...society." With these words, the terrorist responsible for the deaths of three police officers demanded his freedom. Herman Bell, a member of the Black Liberation Army, a domestic terrorist organization that declared war on the United States, was convicted of killing two New York Police Department officers in 1971 and later pleaded guilty to killing a San Francisco police sergeant. He will walk out of a New York State prison next month, the result of an egregious decision by the current New York parole board. Parole commissioners denied similar requests for Bell's release during the last 14 years based on the serious nature of his crime, which they said "represents one of the most supreme assaults on society." What changed their minds? Since when is a terrorist killing police officers no longer a danger to society? In their current decision, the parole commissioners reasoned that Bell "was productive in prison." They pointed to the fact that he had earned two college degrees and had been influential in numerous community outreach organizations as far away as Maine. What they either overlooked or completely ignored was that, in addition to those activities, Bell had also established ties with other domestic and international terrorist organizations. People who support groups such as the Anarchist Black Cross movement, the Antifa movement, Hamas, Islamic Jihad, and the Palestinian Solidarity Movement have visited and communicated with Bell during his time in prison. Others affiliated with those same groups were cellmates of his. Bell was also active in the anti-Semitic BDS movement and had posted statements supporting the current violent attacks against Israel. Fearing that parole commissioners might learn of his radical leanings, Bell had his internet postings erased from his website just prior to his parole hearing. For years, Bell had denied responsibility for the officers' deaths and claimed that he was a "political prisoner" unjustly incarcerated by a totalitarian government. Bell's supporters argue that the 44 years he spent in prison was enough. When you consider the three lives lost, however, it amounts to less than 15 years in jail for each police officer he killed. In the late 1970s, members of the Black Liberation Army joined with other domestic terrorist organizations like the Weather Underground and the FALN in committing violent terrorist acts, including armed robberies. 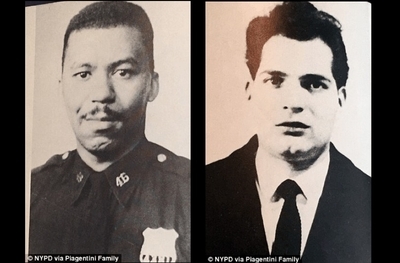 The most infamous was the Brinks robbery in 1981 in Nanuet, N.Y. that ended in the killing of two police officers, Edward O'Grady and Waverly Brown, and a Brinks employee, Peter Paige. Many members of these terrorist groups were subsequently arrested and sentenced to lengthy prison terms. Some escaped and fled to Cuba for asylum but maintained contact with their jailed members. Once in prison, these domestic terrorists were neither remorseful nor rehabilitated. Instead they continued to evolve in their terrorist ideology. In my book, The Fertile Soil of Jihad, I detailed how investigators from my office and the NYPD's Intelligence Unit discovered that many of the incarcerated domestic terrorists like Bell had formed an alliance with imprisoned jihadists. As far back as 1999, the FBI had learned of this alliance between several members of the BLA and a group of Middle Eastern inmates whom they met in the prison mosque. They dubbed themselves the "Talem Circle," and according to an FBI report, the BLA members were tasked with "facilitating training, weapons procurement, and explosives for members of the Middle Eastern community." The report went on to say that they had established contact with Jamil Al-Amin, the former Black Panther formerly known as H. Rap Brown, who converted to Islam while in Attica State prison. Following his release, Al-Amin became the spiritual leader of the nationwide Dar-ul-Islam Movement, a Sunni organization which was born out of the Muslim Students Association in Chicago. Al-Amin was arrested in March 2000 for the shooting death of Ricky Kinchen, a Fulton County Georgia deputy sheriff who was attempting to arrest Al-Amin on a fugitive warrant. Al-Amin was also convicted of wounding Kinchen's partner Aldranon English. Al-Amin is serving a life sentence in federal Bureau of Prisons' SuperMax facility in Colorado, and like Herman Bell, claims that he is a "political prisoner" and not a cop-killer. Not surprisingly al-Qaida has affirmed that claim by listing him in Inspire magazine. The NYPD Patrolmen's Benevolent Association, which represents the more than 35,000 police officers, has petitioned the court to overturn the parole board's decision. The Board did not consider the sentencing minutes or the concerns of the slain officers' families in deciding to free Bell, the PBA argues. The families of Joseph Piagentini and Waverly Jones lost a husband, a father, and a brother. The hurt from that loss has not diminished over the years. Meanwhile Bell was allowed to marry in prison, enjoy conjugal visits, father children and grandchildren. His family was allowed to enjoy the pleasure of his company every week, something his victims' families were denied because of his cold-bloodedness. We can only hope that the judge will consider the totality of Bell's terrorist acts and reverse the parole board's foolish decision, sending a clear message that there is no atoning for the lives of those killed by terrorists. Otherwise, another outrageous decision to release a murdering terrorist may be made in less than three months, when Bell's co-defendant and fellow terrorist Anthony Bottom, now known as Jalil Abdul Muntaqim, appears before the same parole board. A free society values the lives of its members, especially those who serve to protect it from terrorism. Allowing terrorists who kill to go free comes with a cost. It diminishes the value of the lives lost. And that is a price we are not willing to accept.